If resourceful, fearless literary detective Thursday Next thought she could avoid the spotlight after her heroic escapades in the pages of Jane Eyre, she was sorely mistaken. Having enjoyed book one in the Thursday Next series, I was keen to see what Fforde would come up with in this next instalment. Happy to say, I was not disappointed. 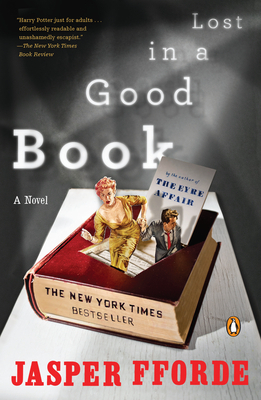 Lost in a Good Book is every bit as funny as The Eyre Affair. I took this one to work to read and it was a struggle having to wait until lunchtime each day to pick it up again. Great humour, a intriguing and captivating plot, wonderful new characters and old favourites and all in all a delightful read. As a keen reader, I naturally love all the references to other texts and authors and this book kept a permanent smile plastered on my face from start to finish. I love this series, although I have an ARC of the last one, and I haven't been able to read the one before yet. Probably because it had been so long since I'd read the series that I couldn't remember it.